Murakami meals • Quick & Tasty - Get Cooking! As promised in my previous post, My journey of learning Japanese, I will start posting recipes for what I call “Murakami meals”, named after one of my favourite authors, Haruki Murakami. Haruki Murakami is a bestselling Japanese author. Food is a recurrent theme in his novels. I love the way he lets his characters prepare food, like Nakata in “Kafka on the Shore” peering in the fridge and whipping up a great meal in no time for himself and Hoshino, or Aomame in “1Q84” eating cucumber with mayonaise, or the narrator in “Hard-Boiled Wonderland and the End of the World” cooking for the librarian. What I call a “Murakami meal” is a meal made quickly with what you find in the fridge. And although Murakami frequently lets his characters prepare and eat Western-style food, I’ll post recipes for Japanese-style food. Also, of course, my recipes will be vegetarian. 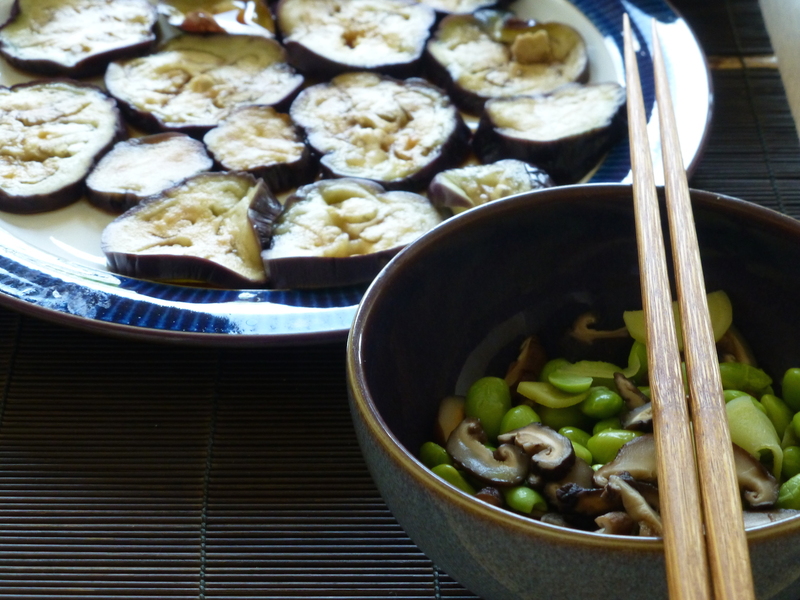 My “Murakami meal #1” is aubergines with ponzu, soy beans with shiitake and brown rice with konbu.